Bangle bracelets are very hot at the moment. From gold bangles to statement bangles more and more women are wearing these beautiful jewelry pieces. The great advantage of bangle bracelets is that they let you use your creativity. You can stack them, wear them as statement pieces, match them to formal outfits or wear them on the beach. The choices are infinite because this charming bracelet style allows you to play with your fashion sense. To help you make the best of the bangle trend, we have created this bangle bracelets buying guide. Read further to find out more about different types of bangles. You probably know that a bangle is circular but, in fact, there are two types of bangles according to their shape. The classic bangle is a circular inflexible bracelet that comes in different sizes. You can wear it as a single piece or stack your bangles to get a layered look. Another type of bangle is the open one. Open bangles feature a gap on the inside of your wrist, just like a cuff bracelet. As opposed to cuffs, the open bangles are usually thinner and more subtle, but they are thicker than classic bangle bracelets. A great idea is to stack three or four classic bangles and, between them, feature an open bangle. Usually, bangle bracelets are made of gold, silver, platinum or another kind of metal. Here is everything you need to know about the most popular metals for bangles. Gold bangles are ideal to wear every day or at a formal gathering. Most fashionable bangles are either gold or gold plated. As you well know, gold can be of various karats and colors. From the karat point of view, you can have 10k, 14k, 18k or 22k gold. 24k gold means 100% gold purity and it is not possible to create jewelry of that because gold is too soft and it needs to be in an alloy. Yellow gold bangles are the most common bangles. Their color is also closest to the gold’s natural color but, of course, it is slightly different because of the alloy. Yellow gold bangle bracelets look great on any skin tone, regardless if they are solid gold or gold plated. Rose gold bangles are very popular at the moment. They get their beautiful color from the copper in the alloy and are great to wear with a flowery summer dress and a pair of sandals. 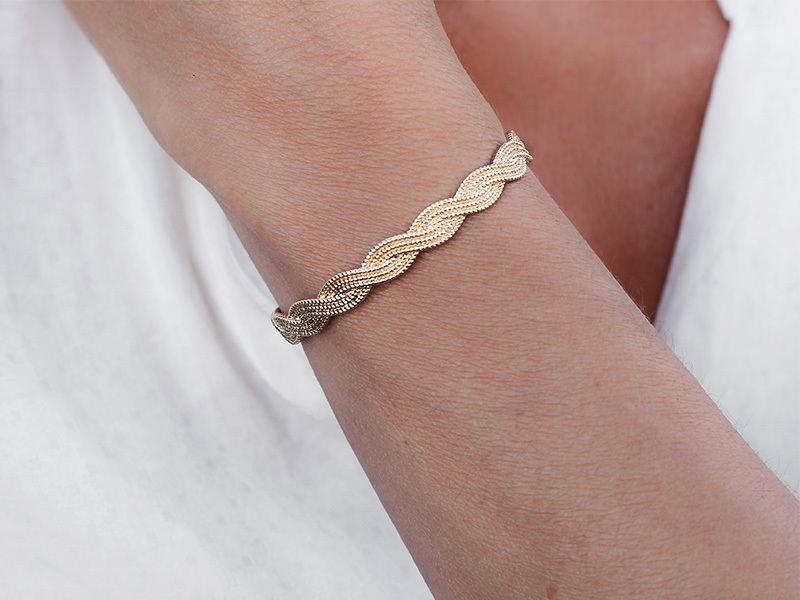 Just like yellow gold bangles, these bangles bracelets can also be solid gold or gold plated. 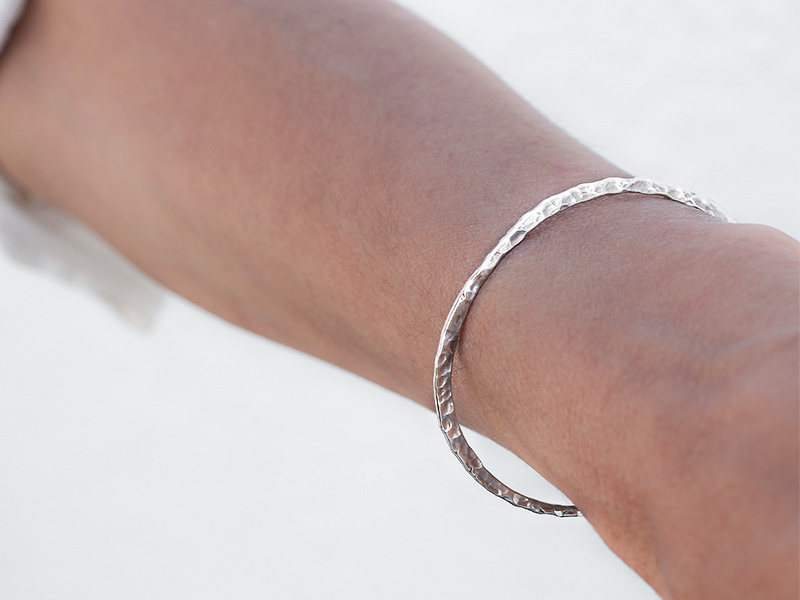 White gold bangles are elegant and more appropriate for formal occasions. Their beautiful sparkling color comes from the palladium or nickel in the alloy. Then, the white gold bangle bracelet is plated with rhodium to remove the yellow tinges. These bangle bracelets are stylish and fresh. They look great with a colored T-shirt and a pair of jeans and are ideal to wear on any occasion. As you know, silver is also a soft metal and it needs to be in an alloy to create jewelry. Because if that it can get tarnished. You have to regularly clean your silver bangle bracelets and remove the tarnish so that they maintain their beautiful look. Platinum is a luxury metal and platinum bangle bracelets look very elegant. You can wear a platinum bangle to a formal occasion and it will look amazing. As opposed to white gold, platinum gets its color naturally. A platinum bangle contains more platinum than a 22k gold bangle, but make sure you get what you want. Unlike other jewelry metals, platinum does not melt so, if you get tired of your jewelry, you won’t be able to reshape it into something else. Diamond bangle bracelets are the most elegant type of bangles. As you can imagine, you shouldn’t wear this type of bracelet every day, but save it for special occasions. When it comes to buying diamond bangles, pay attention to the color of the diamonds. The whiter the color, the more high-quality the stone. Also, don’t forget to inspect the setting to see how secure the gemstones are. One of the safest settings for bracelets is the bezel setting. Of course, there are also other types of bangle bracelets. From titanium bangles to copper ones, you can find a great variety of this beautiful jewelry item. To view our unique bangle collections, visit Ana Luisa online shop. We feature only limited-edition designer pieces, so make sure you get yours as soon as possible.